Over 60 years ago, a milk truck driver in northern New York complained to Julius Sämann, a local scientist, about the smell of spilled milk. Sämann had lived in the Canadian pine forests extracting aromatic oils. He went to work and, using exceptional fragrances on specialty material, soon invented the first automotive air freshener. He drew the little evergreen shape and gave it the brand name CAR-FRESHENER. These LITTLE TREES proved to be an efficient, high-quality solution to a common problem and soon they were flying off shelves. Orders started rolling in from all over the country and quickly gained a strong international following. Julius' pioneering product has become a global symbol of freshness and quality. In the UK and Ireland Little Trees are marketed under the Magic Tree brand. 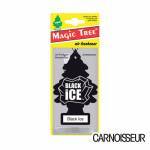 Carnoisseur are proud to offer a small range of Magic Trees. The range is available online and from certain Carnoisseur Outlets that stock the selected range.